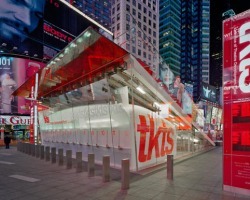 The TKTS offices sells discount Broadway tickets in London and New York. Tickets are priced at 25-50% of their face value, but can generally only be purchased the day of the show. Expect long lines and the possibility of not being able to see the show you came for. But, if you just want to see a show for cheap and don't particularly care which one, this is a great way to get some cheap seats. Check their website for more information. Sundays: 3pm until one-half hour before the latest curtain time being sold.